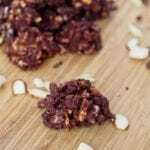 This almond chocolate nut clusters recipe makes for the perfect dessert ready in minutes and requiring only a handful of ingredients. No baking required and gluten-free. Whenever I come to visit my parents they always always always request that I make my chocolate nut clusters for them. They simply cannot get enough of these crunchy, chocolately little treats. It’s my dad in particular that will not let me come home without making these for him. And so I’m always trying to switch up the ingredients to keep things interesting. Sometimes I’ll use peanuts, other times hazelnuts and this time I went for almonds. Not just one style of almonds – we’ve got both the slivered and the sliced almonds in here. Yay for almond variety! And yes you’re really better off adding both. There’s just something different in the taste of the thinly sliced ones with a tiny wedge of almond skin on the side there, versus the chunkier almond slivers. If you only have one type of almond on hand to use for these chocolate nut clusters, use whole almonds that you have crushed up. Though if you have both slivered and sliced almonds, then you’re really in for a treat. Definitely give both types a light pan fry to get them nicely toasted too — the nuttiness really comes through then. Just make sure to keep an eye on your nuts as they’re toasting — do not let them burn – it happens quickly! Trust me, I’m speaking from experience here! Since we all know I love puffins though this wasn’t a difficult purchasing decision to make. And there are pictures of the puffins as well on the box which always brings a smile to my face. There’s also the puffin trivia facts on the back of the box too. Puffins are my favorite bird (by the way – fun fact about me)! Basically all around the most educational cereal purchasing experience I’ve ever had. Back to my almond chocolate nut clusters recipe. 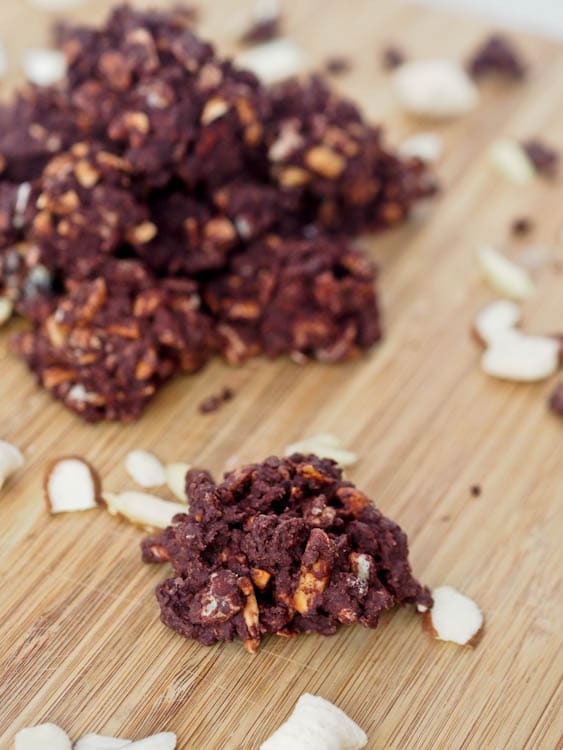 These chocolate nut clusters are seriously the easiest dessert you will ever make. No baking required and only a handful of ingredients that just need to be tossed and smashed all together. Melt the marshmallows and chocolate together and once that is one melted mixture add the nuts and crushed cereal. Remove from heat, mix together. Form little clusters, freeze lightly and you’ve got these delicious almond and chocolate nut clusters ready for sampling. Super crunchy yet with a deep and rich chocolately flavor. Freeze for up to an hour before serving and then store in the fridge for as long as they last! 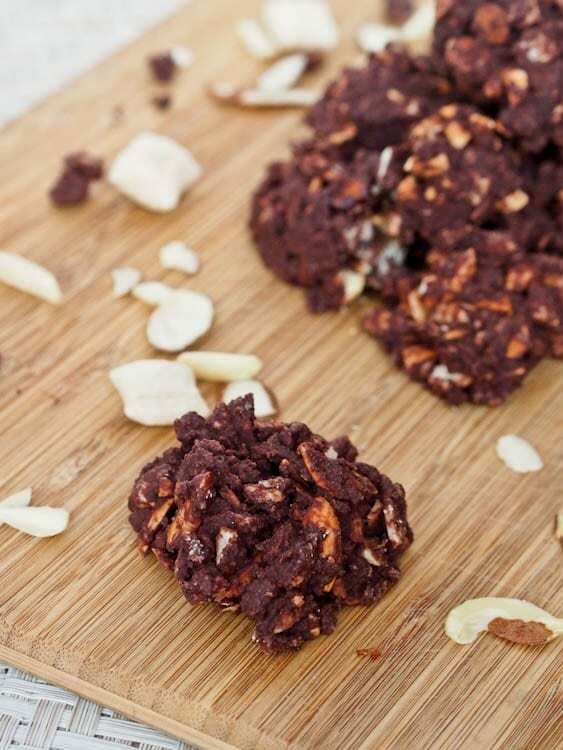 These chocolate nut clusters are a great low fuss way to impress those dinner guests. I know mine are always impressed with this dessert! Heat oil in a pot over low heat. Add chocolate chips and marshmallows. Stir until both have melted. Mix. Add almonds and cereal and mix. Remove from heat. Use tablespoon measuring spoon to form small balls. Place balls on parchment lined baking sheet and freeze for 20-30 minutes until firm. I absolutely like really easy desserts like this one. Thanks! This one really is so easy to put together and you can sub in any kinds of nuts or cereal that you like! ooooh I adore nut clusters-especially this almond version! Thanks so much! No shortage of options for nut clusters — any kinds of nuts/chocolate/cereals can be used! This looks amazing! Anything chocolatey!!! Thanks for linking up at Share Your Stuff Tuesdays 🙂 Hope you come back next week!! Oh these sound like the perfect touch of sweet treat! Thanks for sharing on Simple Meals Friday, you’ve been featured.